Home » Uncategorized » You Got Trumped! Trump not yellin’ about Yellen anymore! Trump does know a lot about what sounds good. Candidate Trump always said he loved a strong dollar. Now that he’s the president who benefits from this easy economic juice, he’s reversed positions on low interest and high dollar. Some of Trump’s supporters might wish he’d gotten honest with them about all of this a lot sooner, instead of just sounding good because this month brought another massive change from a guy whose orange color and constant flip-flopping make him look more like King Salmon than anti-establishment president. A lot of Candidate Trump’s supporters liked it when he often hinted that Janet Yellen would have to go once he got elected, just like they liked it when he was going to lock up crooked Hillary. Last Wednesday, however, Trump aligned himself completely with the nation’s central bank even to the point of indicating he may actually reappoint Janet Yellen for a second four-year term as Fed Head. 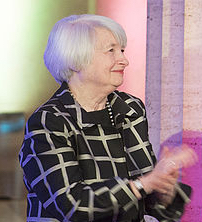 Just as Hillary and Bill became “good people” as soon as Trump won the election, so Yellen is now a person about whom he says, “I like her, I respect her.” Is that any wonder, since Trump’s Goldman Boys, Steven Mnuchin and Gary Cohn, have done nothing but praise Fed Chair Janet Yellen? In an article last year, “Trumponomics: Going for a Ride on the Trump Train,” I warned that Trump’s Goldman-Sachs cabinet members were an almost certain sign of where his administration would head once he got in office. A lot of readers on Zero Hedge were upset that I wasn’t giving Trump a chance to even get into office before I pointed out that Trump’s promises were going to run off the rails quickly, but I call things as I see them, regardless of how popular that is. That was then, and now here we are … exactly where I said it looked like we’d be. Will any of those readers who stormed off mad because I was pointing out danger signs in the establishment candidate now come back? I doubt it, but I write what I believe is true, even when I am certain it will only anger my anti-establishment base. In the “Baggage” article, I pointed out that Trump had already backtracked on Hillary; so it shouldn’t come as any surprise that he just backtracked without blinking an eye on Yellen now that his presidency will benefit from Fed leniency. It is hard to lose faith in your candidate, so some readers at the time concocted a dream that Trump was shrewdly pretending Hillary was OK just so Obama wouldn’t feel the need to pardon her. (You know, playing 4D chess with his opponents.) That way, as soon as Trump got in office, he could lock her up. Have you seen any moves to lock up crooked Hillary? Seems that conversation is completely over. Hillary won’t ever get locked up by Trump, and Yellen won’t be “toast” either (unless, of course, she lets her fake recovery blow up on Trump’s watch). To soften the way for her second term, Trump noted about the position of the Fed chair, “It’s not easy to find somebody who is going to have credibility in that job.” Apparently, he now sees her as one of the few people who have credibility. Yikes! As I recall, Alan Greenspan, who played a huge role in setting up the Great Recession, succeeded in getting things built up to such high crash levels because he had so much credibility that no one in congress seriously questioned his ever-loosening terms of credit. The truth is Trump sees rising interest as rapidly eroding the hopes for his stimulus plan, which depends on a huge increase of debt at a low level of interest — another problem I pointed out last year when I wrote about how Trump’s stimulus plan contains the seeds of its own destruction. If you hoped a vote for Trump would reform the Fed, guess again. Trump isn’t even going to reform monetary policy as the chosen way to stimulate the economy, much less audit the Fed, much less do away with a cabal of banksters owning the US monetary system. A vote for Trump was a vote for more of the same when it comes to the Fed and it economic recovery program … until it all comes crashing down of its own dead weight. Trump also recently reversed his long-held position that the Export-Import Bank (which loans taxpayer money to aid big businesses like Boeing) should be defunded. Sounds like the Goldman Boys are, indeed, in the economic driver’s seat at the White House. Trump likes whatever they like.